This is a busy county town in Donegal. The town is at the head of the Swilly Estuary. It is most famous for its salmon fishing and at Ireland and Scotland Luxury Tours we have taken clients there to enjoy the catch. Letterkenny boasts one of Irelands longest main streets. The town has an impressive cathedral – Saint Eunans. The cathedral was built at the end of the last century. 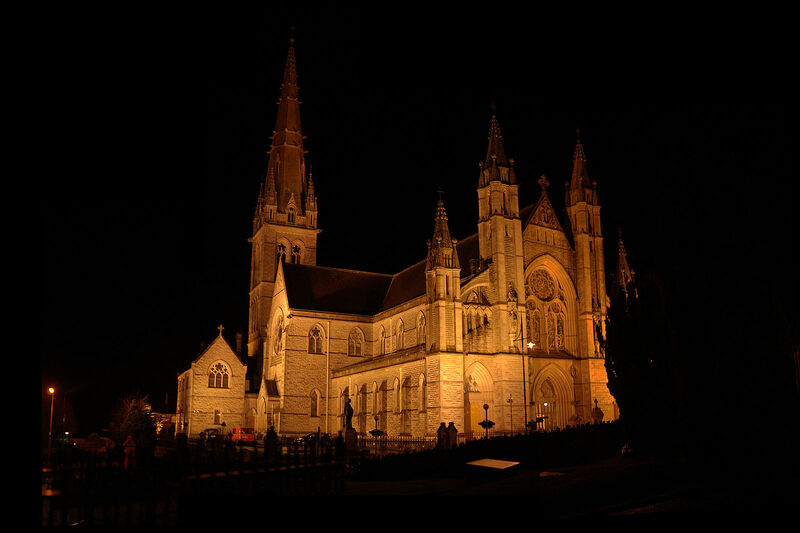 It is neo-Gothic in style and was built with sandstone from Mount Charles, on Donegal Bay. It has a very tall spire and features a lot of Celtic carvings. The ceilings were decorated by Amici of Rome. Nearby is Saint Eunans College. This is a stone built boarding school. It is castellated with a small cloistered courtyard. To the west of the town are the remains of Conwal Monastery. Do take a look at the numerous ancient tombstones in its cemetery. On your tours of Ireland, you should try and take in Donegal and pay a visit to Letterkenny on your way through.